Monique Trottier has kindly invited me to be on a panel at Bridging Media, a one day conference March 29th in Vancouver. 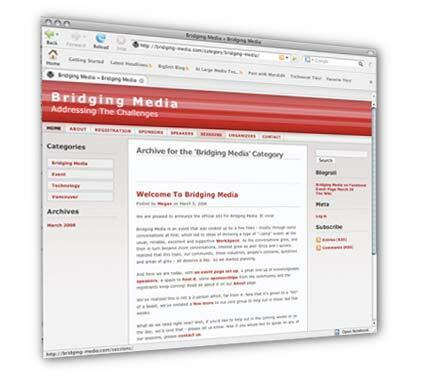 Bridging media is an event designed to open the channels of communication between the broadcast and digital media communities. We aim to increase an understanding of our respective industries and strengthen our approach to building multi-platform projects. So far, the attendance list seems to be weighted pretty heavily on the digital media side – so if you’re in the broadcast sector, you might want to check out the list of sessions. Help to open the communication between the broadcast and digital communities. Find solutions to the misunderstanding between our communities and processes. Work together and strengthen our future projects. One of the gaps between the two you don’t need to spend a day at a conference to figure out is this one. Weekends. The conference is on a Saturday, and it’s no surprise there aren’t any broadcasters on the organizing committee. The digital sector may relish working 24.7 but broadcast’s A-team is strictly a Monday through Friday crowd. Weekends are for Whistler or the Gulf Islands. Chances of them giving up their Saturday for something work-related are super slim. “The conference is on a Saturday, and it’s no surprise there aren’t any broadcasters on the organizing committee. Truer words have seldom been spoken. Unfortunately with such events, when the organizers don’t talk to people like me who actually work in both fields but instead assume that the two fields are one and the same, the bridge will only be built on one side of the river. And one-sided bridges tend to crumble before they are completed. I’m still looking forward to the event, but I’m concerned that there are going to be very few people from the “other” side attending… we’ll see.